It’s time for spring cleaning and what better way than to declutter the apps on your phone? Take a look at which ones you are no longer using and download some new ones to help life be a little easier and more fun. Apps come and go with the seasons and with new ones constantly hitting the market, it can be hard to keep up and sift through to find the ones that work for you and your lifestyle. We have compiled some of our favorite apps to ease your life and inspire you. Make your phone do the heavy lifting while you reap the rewards! All apps can’t be as good as Silicon Valley’s prolific “Not Hotdog,” but here are some runners up that we can't stop trying to convince our friends to download. Heard your parents discussing stocks and always tune out? Me too. Interested in learning more about Crypto Currency like Bitcoin? Or just getting started in investing in some of your favorite companies? Then this is the app for you. Try giving stocks a shot to see if they are for you with Robinhood's easy-to-navigate interface! Tracking your investments is simple and made less intimidating with Robinhood. Take some time for yourself and your mental health with Breethe. For those both new to meditation and experienced pros. Whatever your style from finding inner peace to practicing balanced breath you’ll find a style to suit your lifestyle and mood. Become more in touch with yourself by giving a few minutes out of your day to focus and get in touch with your surroundings. The Buzzfeed brand Tasty has recently branched out and created their own app to inspire your inner chef and attempt to put an end to indecisive eaters. Attempt. Watch their videos for inspiration, follow the recipes provided and even see what cooking equipment is required. Tasty is a great way to get yourself out of a cooking rut or learn how to make a giant meatball stuffed with spaghetti—we aren’t here to judge. Apps exist to make your life easier, and Mint is no exception. Keep track of your finances with easy-to-see breakdowns of your expenses to help you save up for that trip to Morocco or see how maybe buying that almond latte every morning is really adding up—not that I’m speaking from personal experience or anything. Nobody wants to be surprised with Aunt Flo comes to town and now there is an app to help. Flo takes all the anxiety away and makes it super easy to track your period. Flo helps give you piece of mind about what is happening to your body throughout your cycle, and even helps you see when you are most fertile to become pregnant. Track your periods, cycle, and PMS and get to know yourself better with Flo. Not a video game person but looking to dip your toes into the gaming world? Monument Valley is a perfect intro. 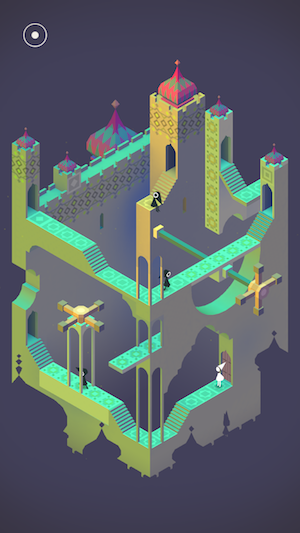 A visually stunning game, Monument Valley is as entertaining as it is pretty. Seriously, you’ll want to screenshot and make some of the levels your phone background. 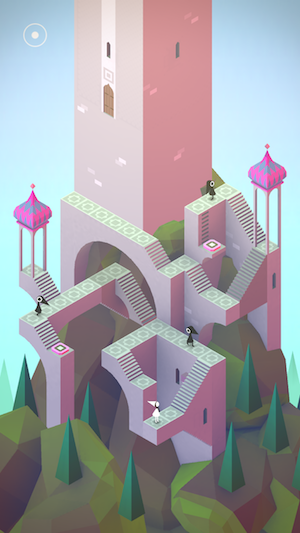 Escape into the world that Monument Valley creates and have some fun helping the little princess find her way home. Tab is one of those apps your never knew you needed but after downloading can’t believe you lived without. It’s always a pain after going out to a meal, especially with a large group, to calculate all the prices, tax, and tip. Tab does it all for you, and by connecting your Venmo it’s faster than ever. Take the guessing and stress out of having a fun, relaxing time, no worrying about who had the cobb salad vs the lasagna. Bumble is making leaps and bounds in the world of swiping to meet people. Known for dating, Bumble also has a friends feature and most recently introduced BumbleBizz, a space to network. Like LinkedIn’s cool, fun sister. Don’t worry all your profiles are separate. Swipe through to get to know people in your field and grow your professional network. I could be SeatGeek’s official spokesperson. I have been telling my friends about this for the past couple years because it has changed the game. From concerts to sporting events, rather than searching through all the different sites, it does it all for you and makes it super easy to resell or get last minute tickets at the best prices. Its biggest flaw is the name is surprisingly hard to pronounce so get ready to repeat yourself, but it’s so worth it. Everyone has an Instagram account they envy and aspire to be like. Adobe Lightroom helps you edit your photos like a pro. Experiment with new looks and see the potential from some of your favorite images. Download Lightroom and get ready to become Insta-famous! Created by Under Armour, MapMyRun works for established runners to improve their time and see mile-by-mile breakdowns as well as those taking their first steps out the door. Explore new routes—or write messages through your path to your friends. Participate in challenges and set goals to assist you on training for that marathon on your bucket list.